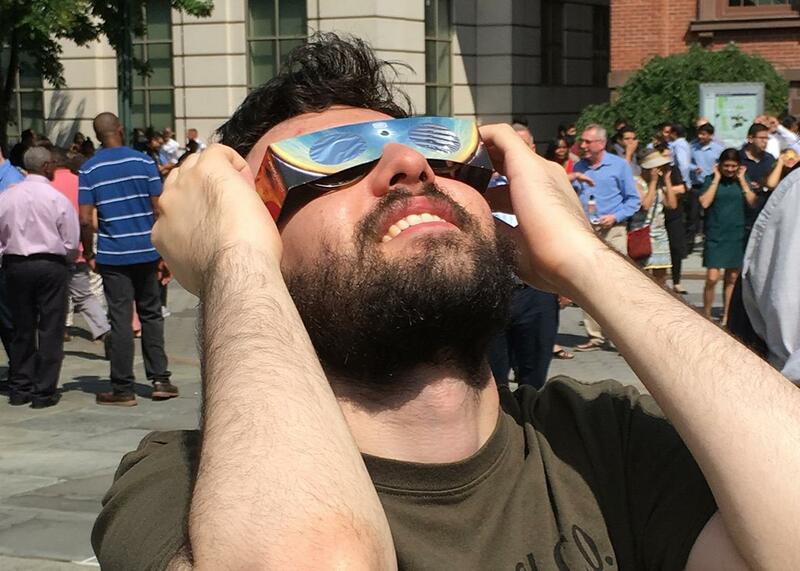 A theater review of the solar eclipse of 2017. A review of the solar eclipse of 2017. Monday afternoon saw the revival of Nationwide Total Eclipse, a heavenly phenomenon last produced in this country in 1979. The spectacle, I am sorry to say, did not bode well for outer space’s career in the performing arts. The disaster unfolded before an exceptionally friendly audience. The viewers in my region started glancing furtively at the sky around 10 a.m., and by early afternoon small clusters of them were forming in parks and on rooftops. (One audience member, visibly enthused, asked me if the performance was ending or beginning: not a good sign.) Most attendees had presumably been drawn to the show by its star, a ball of fire that goes by the lowercase moniker “sun” and is currently fending off allegations of having damaged the Petermann Glacier. The directors of this production, though, chose inexplicably to foreground not sun but a lesser-known performer made entirely of dirt. The dirt-sphere stood in front of sun for the duration of Total, drastically dimming the outdoor arena and ruining the geometry of small gaps between shadows. The occlusion was at first subtle and indeed novel, the sort of anomaly that breathes new life into an old warhorse. But it increased unabated as the audience and affected fauna fell silent, completely in the dark as to what was going on, what it signified, and whether it was intended. By midafternoon, sun was nowhere to be found and—with hours of Total to go—the audience left en masse. Physical theater is notoriously hard to pull off, especially for American audiences. (A 1999 staging of Total was, by all accounts, successful in France.) If the universe hopes to play in Peoria, it will need to rein in its experimental tendency. As all experienced dramatists know, you must master the rules before you break them. I suspect it will be many years before the next production of Total. (Just imagine the lawsuits en route from solar energy companies, the Sky Actors Guild, and phytoplankton.) And thank goodness: It is a barefaced scam. American entertainment—from the old-fashioned medicine show to the merchandise sold in connection with movies, television, rock ’n’ roll, Netflix, and comic books—has never shied away from soiling art with retail. But the producers of Total perpetrated a particularly crass gimmick, requiring the audience to purchase protective eyewear if they wished to avoid irreversible retinal damage. Attendees were given no warning of this hazard, as they certainly would have received at an event featuring strobe lights or dynamic liquid. There was no skywriting, no zeppelin, no annunciatory angel; the press alone was responsible for staving off disaster.